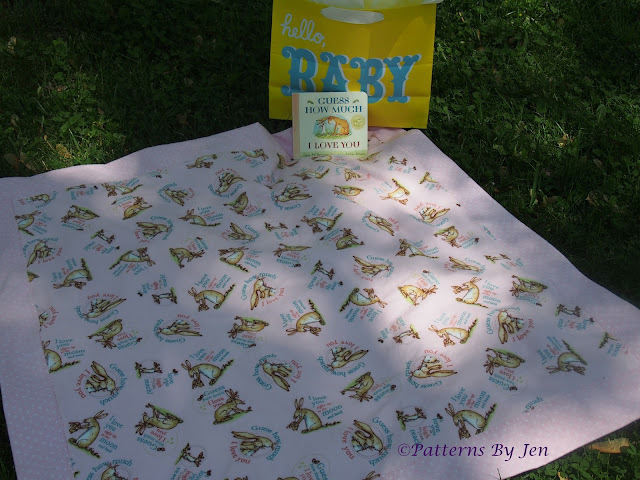 My next Picked By Jen is my favorite, go-to baby gift. The receiving blanket. 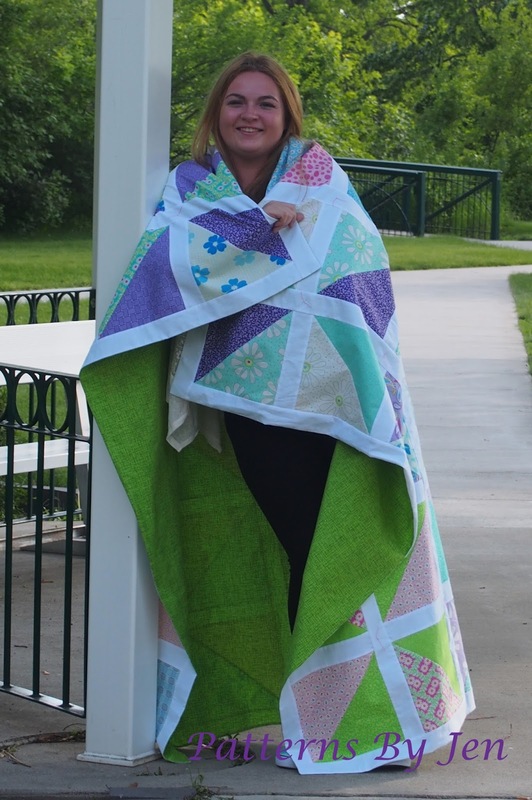 Nobody does it better then Jenny Doan at Missouri Star Quilt Company. If you haven't seen it yet, she has a fabulous YouTube video here that explains the whole process. With all of the cute flannel out there, it is hard to justify making anything else. When you can give a favorite book, like Guess How Much I Love You, with a matching receiving blanket... you've just hit quilter gift giving heaven. I bought yards of this gorgeous flannel in pink and blue (and I think I need to get some of the cream) from my LQS, Fabrics Plus, in Marshall, MN. It is the Guess How Much I Love You TM line from Clothworks. If you can find it, I highly recommend picking some up. 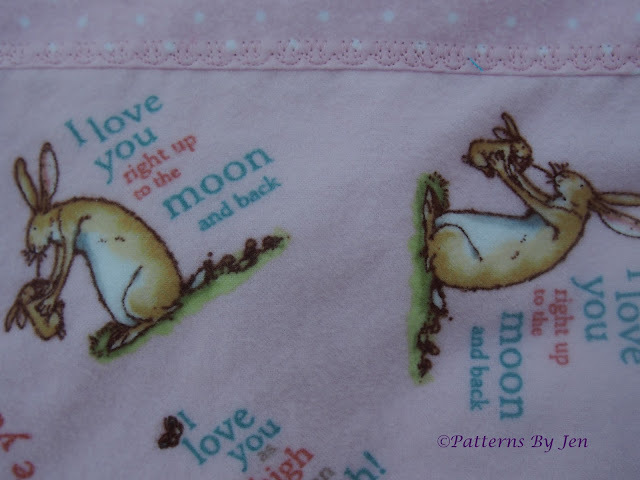 It is so soft and easy to work with, and too darn cute! These receiving blankets also give you the chance to use those fancy stitches on your machine. I love that I can just guide it and the machine does all of the work. After all, I work hard, somebody else should pull their weight once in a while. A sweet, simple gift for sweet, simple bundles of joy. There is no affiliation with any of the links shared on this page, just me sharing what information I have. Memorial Day is coming up and who doesn't love a good BBQ with the family. And what goes better with BBQ and family then a quilt? 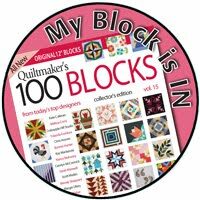 Well, maybe cold drinks, yummy deserts and campfires, but a quilt should be on the list, too. This one is quick and easy and uses a Layer Cake and a Jelly Roll. Download Half Square Triangles here. These instructions use an unfinished size of 2 1/2", but the way you make HST are the same, you are just squaring to 9 1/2" unfinished size. I used Moda's Bandana and Robert Kauffman's Kona Solids in white. You will need a total of 36 squares, mark the diagonal on the back of 18 of them. Square to 9 1/2". There will not be a lot to trim off. Lay out your HST's in an appealing pattern. I tried to go for pinwheels, and I had to lay them out a few times before I got the finished project. 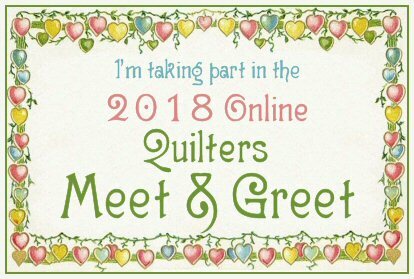 *Hint: After laying out your quilt take a picture with your cell phone or camera. It will let you see a square that stands out or a color that doesn't really fit in the place it's at. 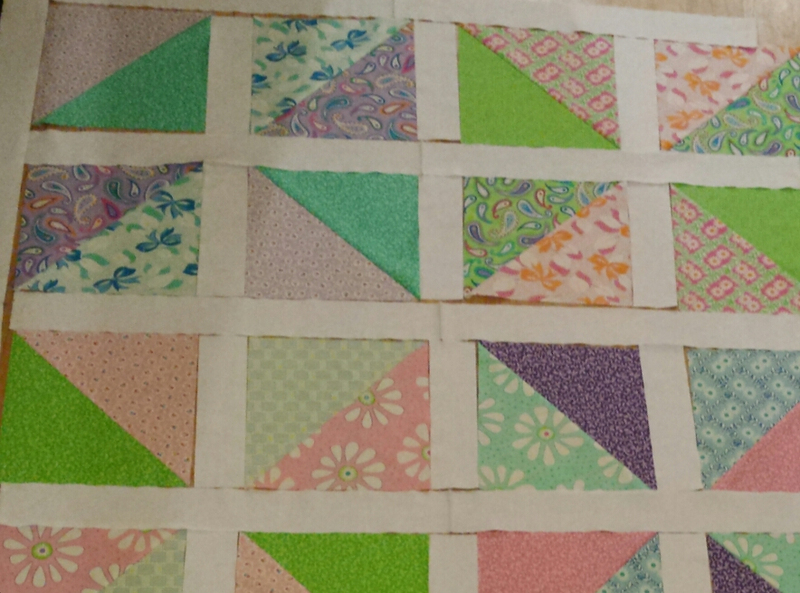 Once you have decided on your pattern sew a 9 1/2" strip to the right side of the first four blocks in each row. last two 68" strips to either side. I match up the seams and pin when I am adding a strip. This helps keep the blocks lined up. 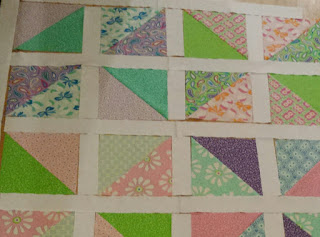 Lay your quilt top, right sides together with your backing. Leaving an 8" opening, stitch 1/4" around the entire quilt. I recommend sewing with the backing on top. Clip the corners and turn your quilt right side out. Give the edge a good press all the way around, and using a slip stitch close the opening. At this point you can quilt it or use embroidery thread to tie it. There are so many options for this quilt. Play around with your blocks and find a pattern that is pleasing to you. Enjoy this light weight quilt. 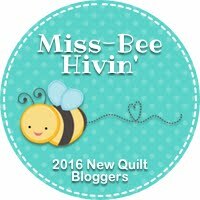 I am linking up with Needle and Thread Thursday from My Quilt Infatuation, and Let's Bee Social from Sew Fresh Quilts. I love to make gifts for people. The trouble is finding the time between the "work" quilting for the "fun" quilting. Which means that sometimes those gifts are late, though I try really hard to make the gifts on time. My Mother's Day gifts for my Mom and Mother-In-Law went out a week and a half late this year. :( Not something I am proud of. But I do love how they turned out, and the rich colors have a lot to do with it. My Mom's gift is The Easy Striped Table Runner from The Quilt Company. I know I'm late to the party, but man was this a quick and simple pattern with a great looking finish. This is wider then the original pattern calls for, but I couldn't get rid of those eggs, they make the center so interesting. The 12 1/2" 60* ruler worked perfectly for it. 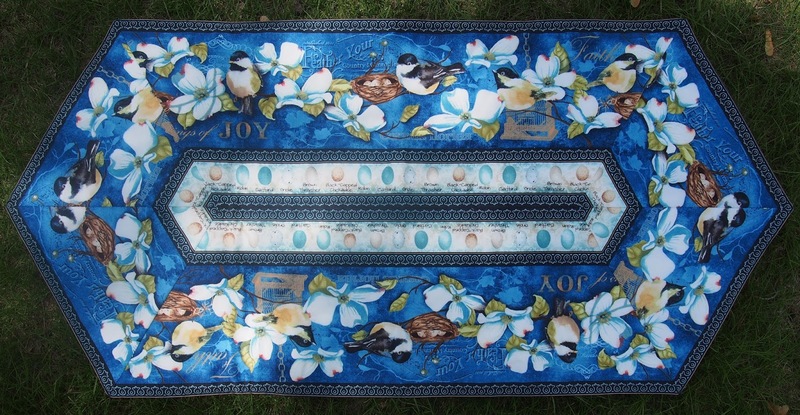 The fabric is Feather Your Nest Fabrics for Wilmington Prints. I didn't do a lot of quilting, you can't even see the stitching unless you go looking for it, because I didn't want to take away from the finish. The blues in this fabric are just scrumptious. My Mother-In-Law's gift is this bright and cheery wallhanging. It's a little bit (a lot) bigger then the usual size I make her, but it will also go nicely on a table. 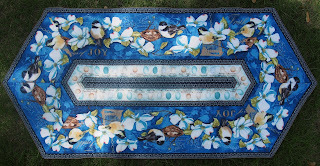 This comes as a panel, called Baltimore Spring by Perl Pereira of P3 Designs for Red Rooster Fabrics. that you cut up and piece back together. I switched out the purple inner border for a blue. 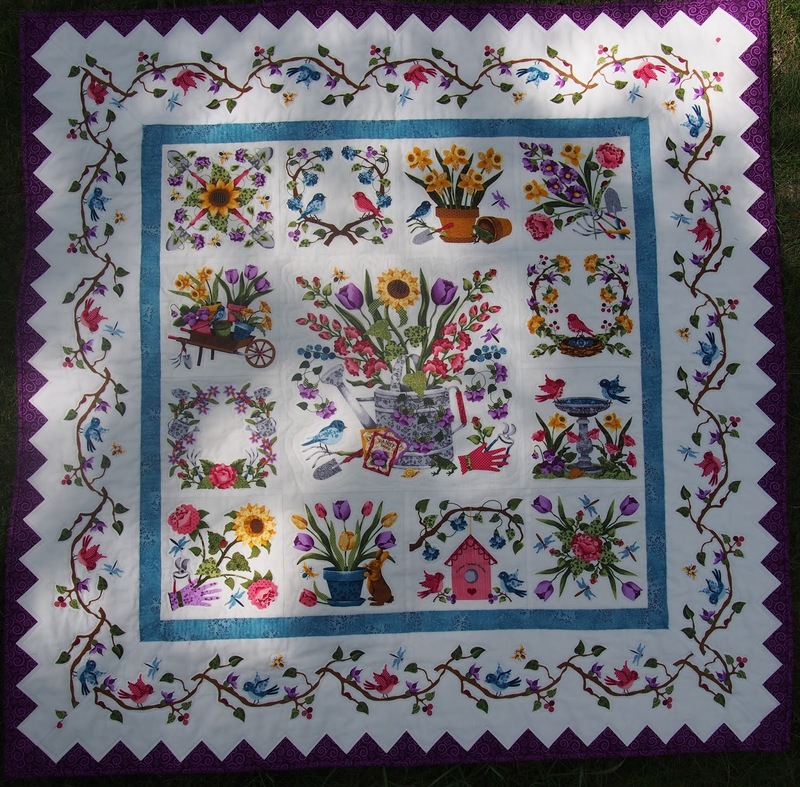 The border is simple and pretty, and the added triangles finish it off nicely. I used echo quilting throughout the entire piece, including those purple triangles. I hope they enjoy the spring a little bit more with these little gifts of love. I am currently working on a free picnic quilt pattern using a layer cake and a jelly roll. I will hopefully release it by the end of the weekend. Do you find it harder to work on quilts when the weather warms up? 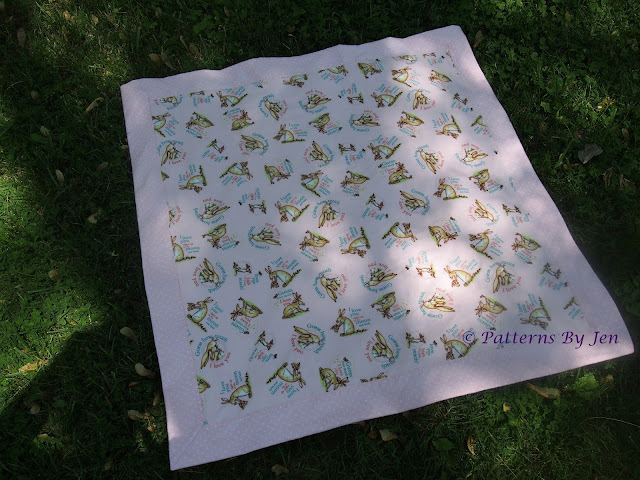 I've been known to move things outside to enjoy the sun and birds, but still sew. How do you keep your sewing mojo during the summer months?